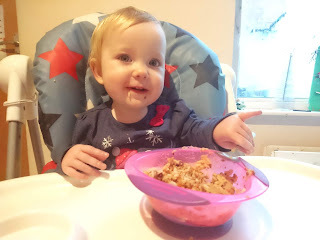 It's hard to believe that this time last year we started our weaning journey with Scarlet. A year later and there are still new tastes and food experiences we've yet to try. It has been an exciting journey for everyone and there is plenty more to come. We're still home cooking most meals for everyone and Scarlet is no exception. When Tommee Tippee got in touch with me to try their Steamer Blender out I knew it would be perfect for those meals Scarlet has that are adjusted for spice and for quick lunches through this winter. 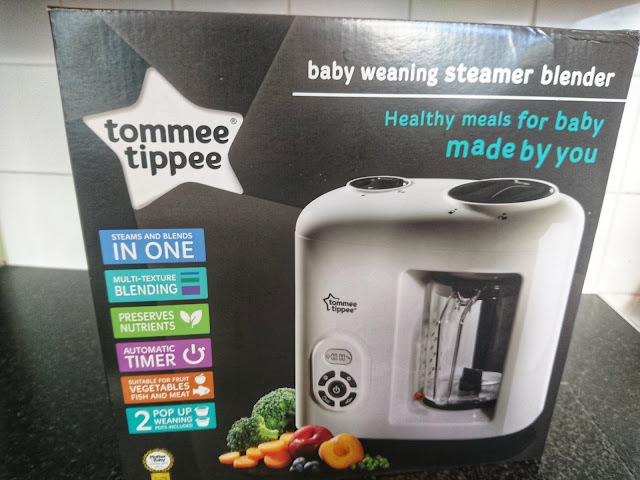 The Tommee Tippee Steamer Blender will take the stress out of cooking fresh recipes for you baby through their weaning journey. Not to mention taking half the time. Designed to be quick and easy to use the Tommee Tippee Steamer Blender is perfect for busy parents who want to give their baby or toddler healthy home cooked meals and tastes. 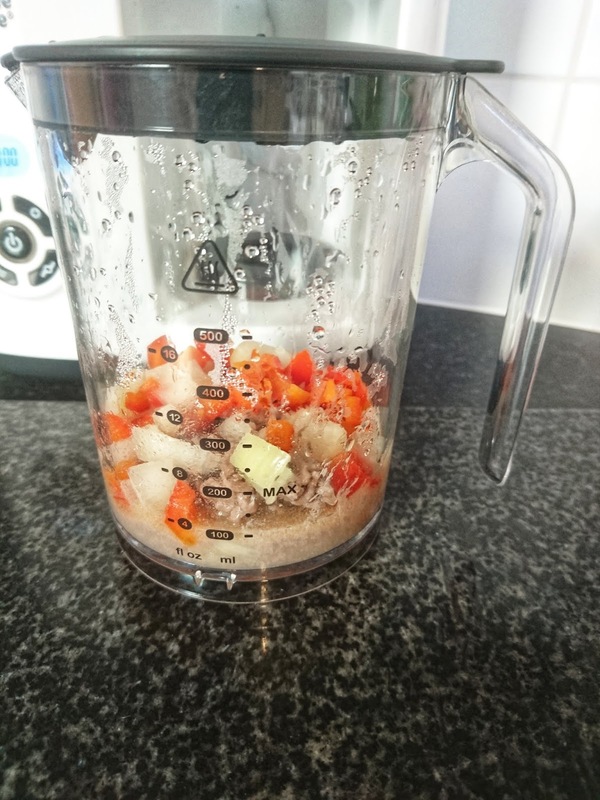 By using steam to cook meals for your little one you won't loose any of those vitamins, minerals and all round goodness the food contains. Which makes the Tommee Tippee Steamer Blender perfect for weaning from the start. Inside the box the Tommee Tippee Steamer Blender is already assembled and only requires you to remove the packaging and give everything a wash before it's ready to use. 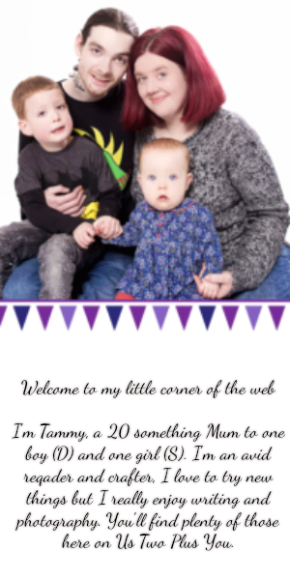 The box contains the care instructions on how to wash and use your Tommee Tippee Steamer Blender, a recipe idea book for all stages of weaning, the Tommee Tippee Steamer Blender machine, a spatula and two Tommee Tippee pop up freezer pots. 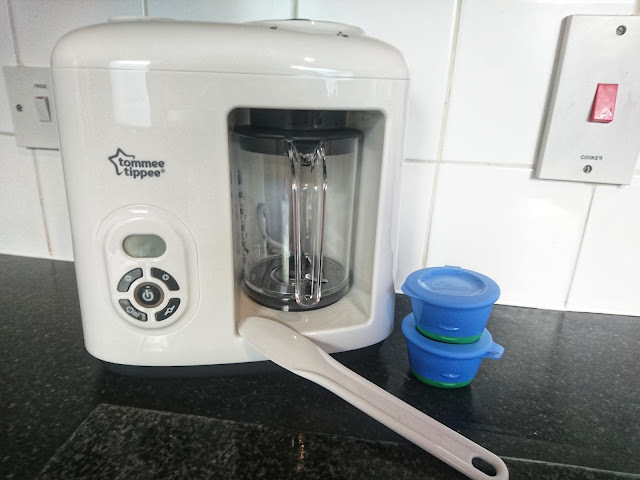 To get started on using your Tommee Tippee Steamer Blender it needs to have 450ml of water added into the water container. 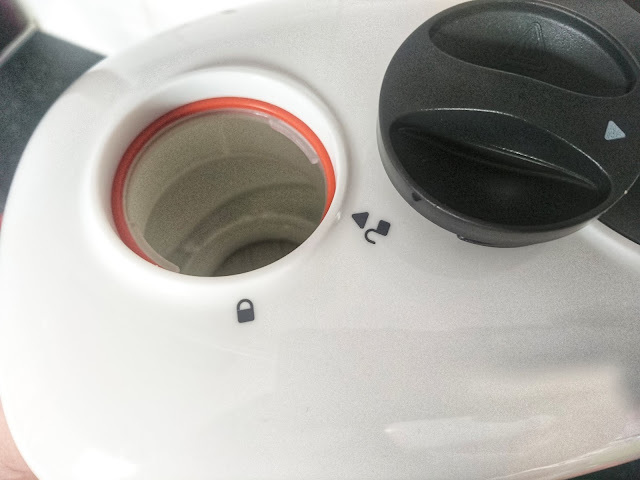 This is located at the top of the machine and can be opened by turning the smaller black circle to the unlock position and lifting up. Just fill it up with your water and close. 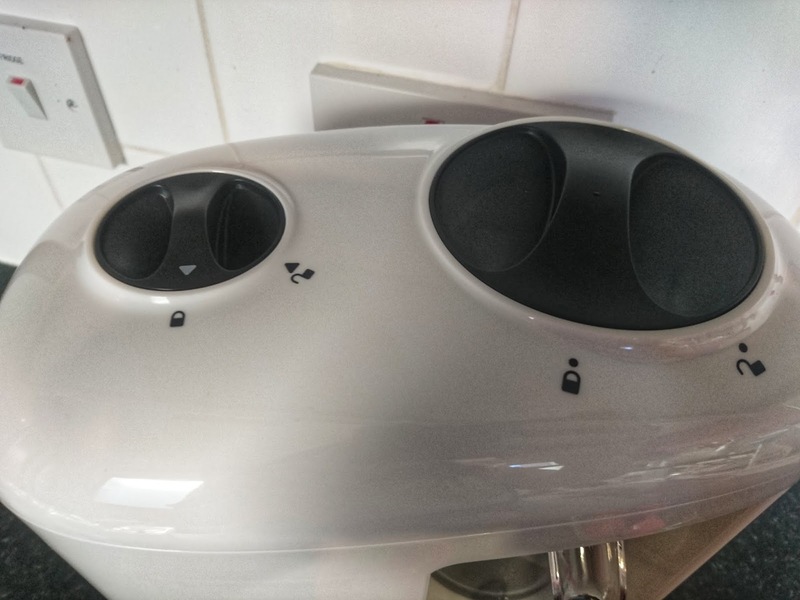 The second larger dial is what locks the food jug in place for steaming and blending. Once your filled up and ready to go you need to choose a recipe you want to make. With various selections in the recipe book inside the box for every stage you'll not be short on ideas! 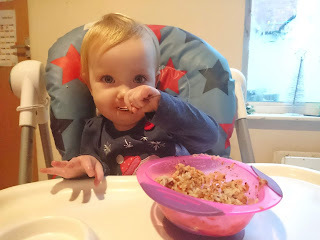 There is everything from super smooth first tastes right up to chunky recipes perfect for toddlers over the age of one. 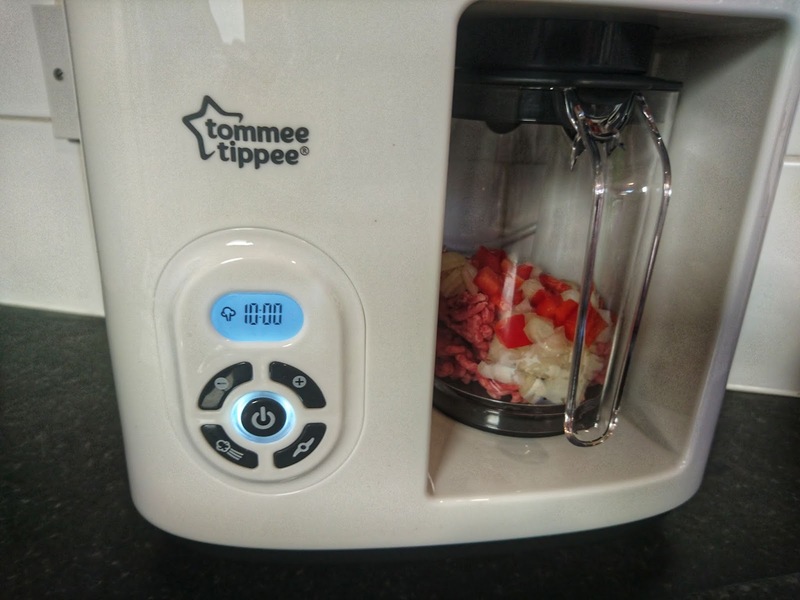 You can make any recipe you can think up in the Tommee Tippee Steamer Blender too. I started with the Mexican Red Meat Mash Up which is basically Chilli Con Carne. A favourite of Scarlet's. To get started I got all our ingredients together. 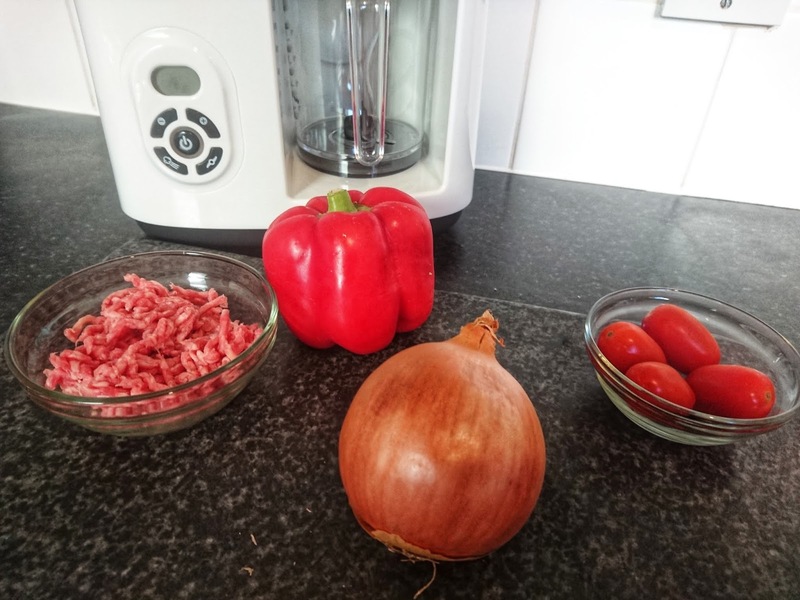 You'll need: 50g lean beef mince, 25g Onion, 25g red pepper, 25g red kidney beans (tinned), 50g chopped tomatoes (I used 4 baby plum tomatoes) and a pinch of chilli powder. 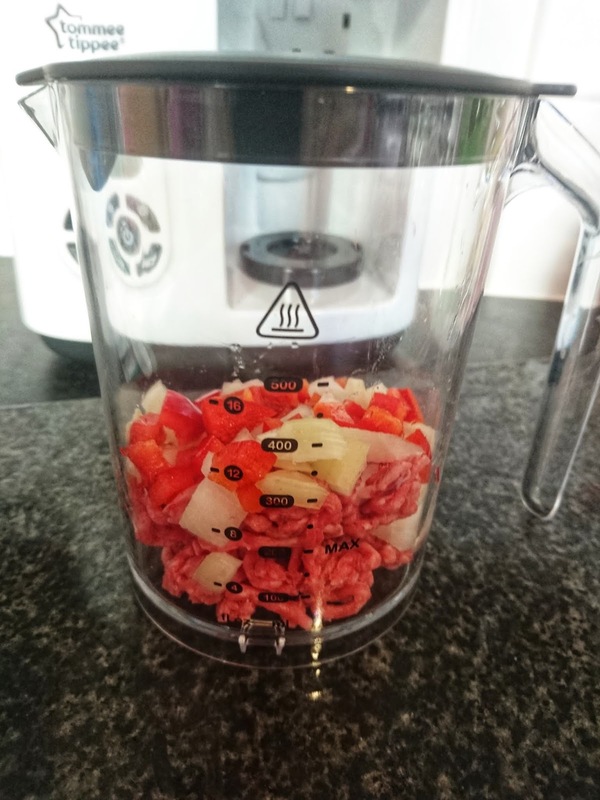 Chop up all the ingredients and in the Tommee Tippee Steamer Blender jug add the mince, onion and pepper. Pop onto the machine and you just need to set the time you want to steam it for. This recipe calls for a 10 minute steaming period to start. Once steamed remove the excess liquid you can see above before adding in the other ingredients. Pop it back on the steamer and set it to steam for another 15 minutes. 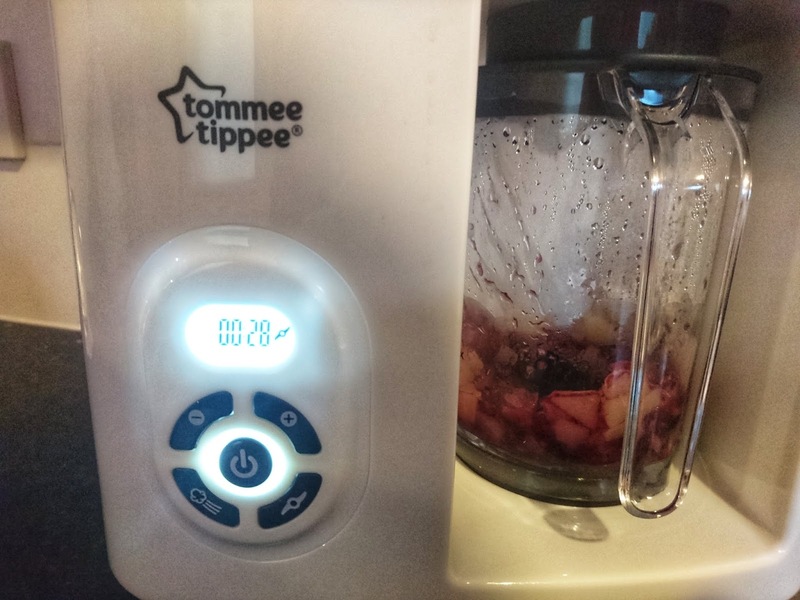 I do recommend keeping the Tommee Tippee Steamer Blender in an open and ventilated area since it does push out a lot of steam. You don't want to use it while it is under a kitchen unit or shelves. The final two steps are to drain out the liquid again and then to blend using the blender setting. Since Scarlet is almost 18 months I used the recommended on the recipe which was 4-10 seconds. This made a nice consistency for Scarlet without big chunks. I do think by blending for longer you could make a smoother consistency. All that is left is to add in some basmati rice and enjoy! I did find that this recipe made enough for two potions when the rice is added which is perfect for a lunch and dinner over two days. Great since all you need to do is keep the extra mix to heat up and add rice. As you can see Scarlet wolfed the lot down! She loved this recipe and I love just how easy it was to make. I used the extra time when this cooked to get us both dressed after a a lazy morning at home. During the earlier stages of weaning you want recipes that are simple, taste good but that also contain one or two flavours to allow your baby to adjust. The recipe book has some great ideas to use the Tommee Tippee Steamer Blender to whip up something for every taste. I love that even now these make for great dipping sauces for finger food as well as being great to add extra to some yoghurt for snacks too. 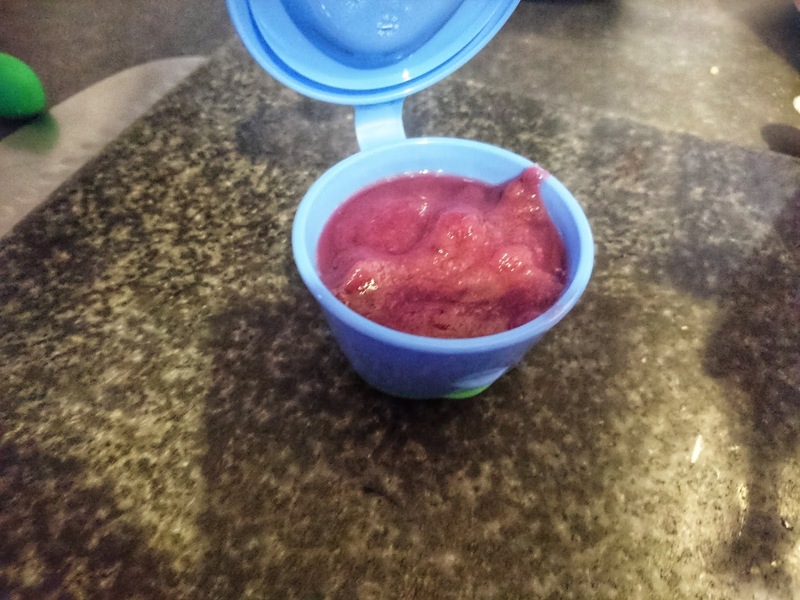 I made Scarlet some pear and blueberry puree for a snack using the Tommee Tippee Steamer Blender. Just as before you need to chop up the pear after you've washed, peeled and removed the core. 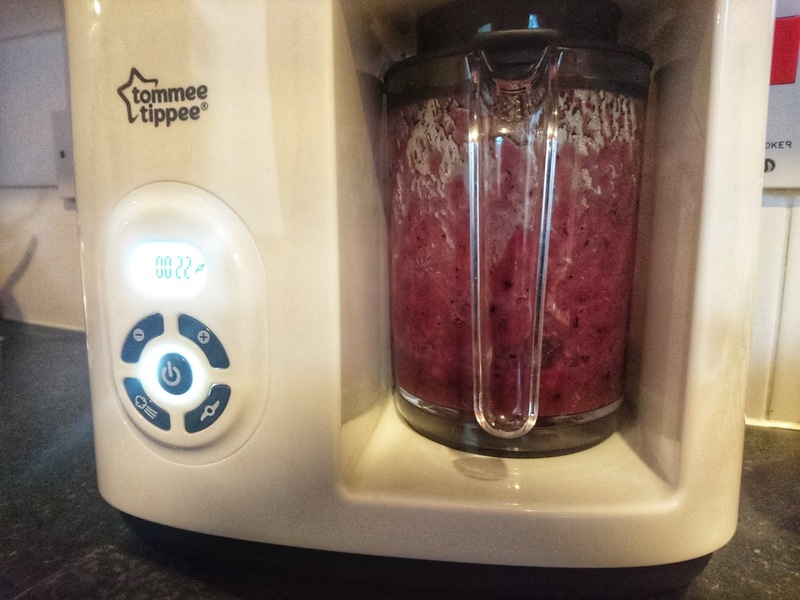 Pop it in the Tommee Tippee Steamer Blender with the 25g of blueberries and steam for 15 minutes. Drain the liquid out and blend it up for 20-30 seconds. I did ours for 30 seconds although 20 would be plenty for more texture when your baby is 7 months or over. I added ours to a pot and allowed it to cool down ready to add to some yogurt for dessert later that day. Although it can be used on it's own, add some crumbled up biscuit or fresh baked crumble mix while still warm for the perfect toddler dessert. 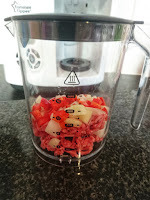 You can even remove half of the mix before blending to add some chunks back in for toddlers if your making a quick crumble dessert. The possibilities are almost endless! What I loved about the Tommee Tippee Steamer Blender was that even at the end it was super easy to clean all the components. The blade comes off the blender pot by twisting the bottom and holding the blade in place with your finger. simply wash and dry everything before reassembling and your ready to go! I can't recommend the Tommee Tippee Steamer Blender enough. I actually wish we'd had one from the start of weaning journey. I made as much of Scarlet's food myself as I could and I still do. I know that even though she's 18 months we will be using the Tommee Tippee Steamer Blender for many more months to come. It's perfect for quick easy cooking for babies and toddlers. Just what every parent needs through the weaning journey. You can purchase your own Tommee Tippee Steamer blender (RRP £117.49) from Amazon (click the link), Argos, Dunelm, George, Very and Boots. Disclaimer: The product featured above have been sent to us for this review. All thoughts and opinions are entirely my own.